Yuzu Essential Oil (Citrus Junos) - Sweetgrass&Rain Inc.
Yuzu Essential Oil comes from the Citrus Junos, a small tree that produces yellow-golden coloured citrus fruits resembling small oranges or tangerines. The peel of the fruit produces a delightful citrus fragrance with a floral overtone which is quite unique and difficult to describe. 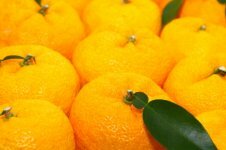 This fruit is known in Japan as Yuzu. Yuzu Essential Oil smells like the unique fruit. It adds an exotic citrus note to blends and is lovely on its own.